What comes to mind when you think of American exports? Cadillacs? Doritos? Those are easy, but you may not consider services like finance and education, and you probably don’t think of American ideas either. 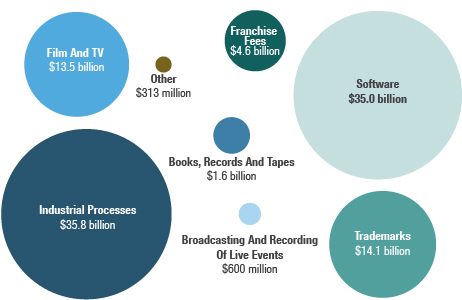 But as shown on the chart below, intellectual property falls under the “Royalties and Licensing” bubble, and makes up a big chunk of American GDP. 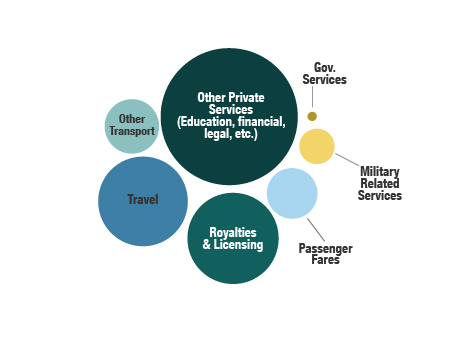 According to NPR’s Planet Money, American ideas bring in about $105.6 billion from overseas. And as illustrated in the next breakdown, the lion’s share of these monies comes from “Software” and “Industrial Processes”—both of which depend on patent protection to ensure the intellectual property is not being abused, and the developer is getting their fair share of compensation from use. “Industrial processes” comprise anything from medicine and drug formulas to trade secrets and technology in manufacturing. It all goes to show that intellectual property, while it may be as intangible as a thought, idea, or simple moment of inspiration, is a big, global business—a business that needs individuals like you to be a part of! 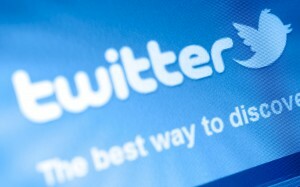 Twitter is making plans for a brand new approach for their in-house patent operations, one they say will “keep control in the hands of engineers and designers,” rather than the traditional corporate patent arrangements in which a company holds all rights related to inventions made by it’s employees. The “Innovator’s Patent Agreement,” or IPA, is a direct response to this traditional process, which Twitter believes can sometimes staunch technological innovation. Understood in the new policy is that Twitter’s patents can only be used for defensive litigation, and offensive litigation is only allowed with the inventor’s permission. The patent agreement can be publicly viewed on GitHub, and apparently is retroactive, applying to all Twitter’s patents past and present. Not only that—but the stipulations apply to subsequent owners of the patent, if bought or sold. “Employees can be assured that their patents will be used only as a shield rather than as a weapon,” says Twitter VP of Engineering, Adam Messinger, on their blog. Twitter’s news has its supporters and detractors, especially since the company is suggesting others adopt the same policy. Critics speculate whether the whole thing is a public relations display—suspicious of why the company would willfully undermine the tremendous value patents have in the tech marketplace. But PR stunt or not, the truth behind all this is that patents are a hot topic in modern technology, business, and innovation. And Notre Dame can give you the tools and skills necessary for you to get in on it! Yes, intellectual property is booming in the U.S., thanks in part to the America Invents Act, which allows for more patents to be applied for and issued. Interestingly, the article also states that overall hires “among law school graduates continue to weaken… the employment rate among American law school graduates fell 4.7 percent last year” according to the National Association of Law Placement. Which is another plus for patent professionals, who with the help of a Masters in Patent Law from Notre Dame, need only to pass the patent bar to be able to prepare patent applications and administer cases with the USPTO—all without the time and expense spent at law school. In keeping with the haute opportunities available to those with a patent background, it seems if the world of law were the world of cuisine, it’s fair to say that patent professionals would be the succulent black truffle mushroom: rare, in great demand, and able to fetch a premium price! The Google/Oracle patent lawsuit is a bell-ringer of a bout when it comes to IP and technology. And if you happen to use an Android device, you’re holding Exhibit A in your hot little hand. Not only does Oracle claim infringement, they say they were willfully infringed upon—that Google knew it was lifting patented technology when building the Android platform. This question of willfulness has a heavy bearing on the amount of reparations should the jury rule in Oracle’s favor. The nuts and bolts of the case are, in essence, a technical he-said, she-said. 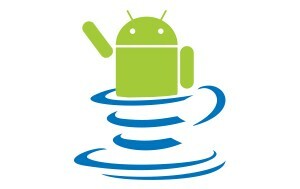 Oracle claims Android works like Java, Google says it works differently. If you know your code and programming, you can check out the specifics at Wired. The spectacle, however, is the courtroom drama and corporate intrigue—Oracle makes its case for “willful” infringement on the fact that one Android engineer worked with Java at Sun Microsystems (which Oracle bought, along with all their patents), and another is listed as co-inventor on one of the patents in contention. The case also has a bearing on the intellectual protection status of API’s—application programming interfaces—basically, the specifications that allow software to “talk” to each other. The Oracle/Google case could set a precedent on whether API’s are subject to copyright. And the most recent twist—a juror has been dismissed, leaving just 11 people who are now deliberating on the outcome. Take a break from studying for finals tonight (May 8th), to watch NCIS on CBS. The US Patent Office is going to be featured as a crime-fighting superpower. Check out the Patent Office’s announcement here. More Alumni Support for Patent Law! The Master of Science in Patent Law continues to get support from successful professionals in the field! Now on board is Mike Wack, a patent agent at Biomet, a premier medical implant and instrument innovator out of Warsaw, IN. Though Mike started as a product development engineer with two other Warsaw-based biomedical companies, he has since moved to patent agency and now does portfolio management, patent preparation and prosecution, and manages outside counsel for the company as well. “Having spent over twenty-one years in product development of medical devices, and now working in the intellectual property field in the same industry, I know how important it is to have well-trained, technical people to assist corporations and law firms in the filing and prosecution of patent applications,” he says. 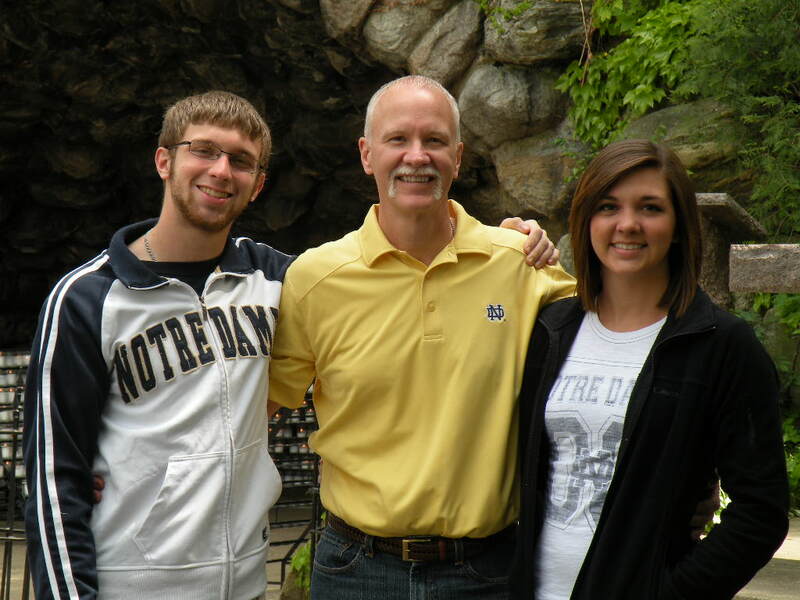 Mike (center in the photo below) comes from a large Notre Dame family that includes his father, two brothers, son Thomas (Class of 2015; left), and daughter Claire (Class of 2016; right). In fact, we have his son to thank for spreading the word. Not only has Mike agreed to mentor a student through the Capstone Project next year, but along with Tom Mauch—a Notre Dame Law School graduate who also works at Biomet—the two will host the students of the Master of Science in Patent Law for an on-site visit to Biomet corporate headquarters for an in-depth look at the business of innovation and its intellectual protection. Our great thanks to Mike! Apply now and be part of the action!